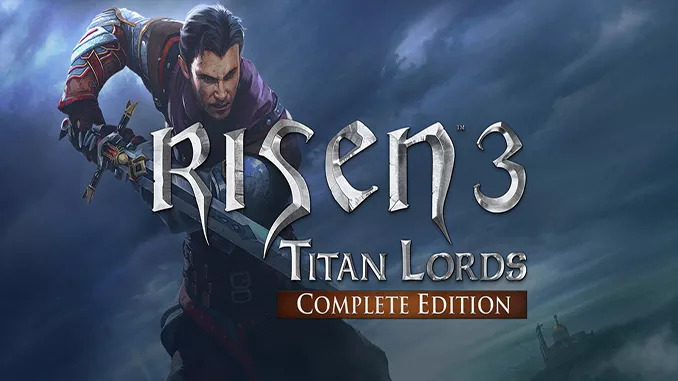 The Risen 3: Titan Lords – Complete Edition includes the main game and the following DLC: Risen 3 – Adventure Garb, Risen 3 – Fog Island, Risen 3 – Uprising of the Little Guys. * Freedom: Freely explore and take on quests at your leisure. Quests will have different ways to tackle them and different outcomes. You can play different parts of the game in whatever order you wish and shape your character individually. * Exploration: Discover quests and characters as you make your way through the diverse world of Risen 3 – Titan Lords. From quaint medieval-style towns to delving deep into the dank dark of mines, to the supernatural shadow world, there is a wealth of possibilities waiting to be explored. You will be able to traverse this world in a variety of ways, from swimming to climbing. * Enhanced combat: Featuring a revamped fighting system, with new animation systems in place that add nuance to the fights. * Magic is back! Crystal magic has returned, bringing with it devastating new combat abilities. Wield elements such as lightning, fire and ice to obliterate your foes, or make use of a multitude of additional magical skills to aid you in exploration – the choice is yours! * Guilds & factions: Choose to ally yourself with one of three distinct guilds, each offering unique skills, armouries and quests allowing you to approach your quest in very different ways. Discover additional factions that exist to bend the balance of political power in the world, each with their own agenda for you to uncover. Be careful which characters you trust – some might ally with you with the intent of fulfilling their own sinister plans. Risen 3 – Uprising of the Little Guys. THANKS FOR THIS GAME…CAN you upload airline tycoon 2 pleasseeee…. I am unable to download. is there anyone to seed this? do you have uTorrent installed on your system?